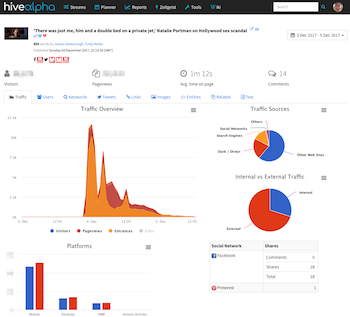 HiveAlpha is an editorial analytics and productivity platform, originally conceived to fill gaps in commercially available SEO tools for publishers. 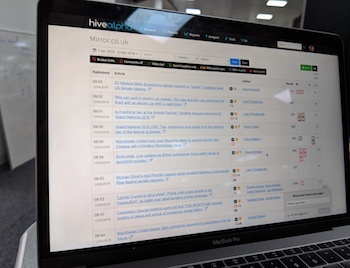 Over 4 years it has grown into a multi-award winning publishing software platform used by hundreds of journalists, editors, SEO & social and legal users across Trinity Mirror. The Streams tool shows the latest content published by Trinity Mirror publications (and some others). This enables the SEO, social and editorial teams to view content being published in real-time, and promote or optimise the content to maximise each article's reach. HiveAlpha provides a unified and usable layer on top of various sources of analytics data, so publishers can make the most of the data available to them without having to constantly switch between third party tools. HiveAlpha makes extensive use of APIs, so is agnostic to the source of analytics. It can report using Google Analytics, Adobe Analytics, Chartbeat or bespoke tracking back-ends. Because HiveAlpha has become a fairly comprehensive tool, there are a number of different touchpoints for analytics data across the site, detailed below. The article analytics page is accessible from the home page, any clickable link throughout the tool, or a simple browser bookmarklet. It provides an at-a-glance overview of an article's performance, shows where visitors have come from, and pulls data from dozens of sources to provide a rich, detailed view of any article. The reporting interface mixes broad performance reports on publisher-focused metrics, including as top evergreen pages, worst performing pages, top authors, top topics and more. These reports combine analytics data with social and information directly from our CMS on what has been published by each author. This gives busy journalists a direct, easy to understand overview of their best and worst performing content. A shared events calendar enables editorial users to see what key events are coming up across departments and websites. The calendar is linked directly with other areas of HiveAlpha, and makes it easy to share and highlight insights on past tactics and content performance. MediaWiki, the software that powers Wikipedia is an excellent tool for an intranet. We used it in HiveAlpha for collaborating and planning content for events, as well as recording past performance and documenting best practices. Powerful, enterprise search is at the core of HiveAlpha, made easy by ElasticSearch. With an index of over 6 million articles, searchers can quickly find new and archive articles using a wide variety of content-based filters. This makes HiveAlpha's publisher-oriented search function more useful and powerful than Google's generic search engine. Zeitgeist monitors what's popular across hundreds of other news websites and displays a dashboard of the most shared articles, filtered by niche. A favourite of editors, it helps monitor dozens of competitors on a single screen. There are 5 daily trending topic emails sent out to hundreds of editorial users that highlights trends across Google, Twitter and the top content across Trinity Mirror sites. This provides valuable prompts at crucial times of the day for editorial teams to focus and refine our top content. Commercial rank trackers are great for sites that operate on a daily or weekly time-cycle. However for news sites, winning in the search results can be down to ranking changes on a minute-to-minute or even second basis. When HiveAlpha was conceived, there were no commercially available solutions for monitoring at such a granular scale, and even now there is limited commercial tracking that will solve for this. HiveAlpha allows rank tracking to be scheduled on a minute-to-minute basis, important for tracking positions during football matches (for example), to effectively monitor performance throughout and assess performance afterwards. A fairly basic training tool, that allows journalists to test how their headlines may look across search & social channels. This utility searches an online film database for the name of a movie, and generates an HTML snippet to embed in an article, with information on the film, complete with Schema.org markup and internal links to the director and stars of the film (where available). Part of the vision behind HiveAlpha was that it would be a home for random experiments and proof-of-concept tools, some of which would prove useful and popular 'graduate' and others that would be less successful. Due to certain CMS issues, tying up versioning information with article performance has been a challenge, and made definitively tying cause and effect was difficult. Inspired by the Newsdiffs project, I built a way to version published articles that looked at the modified date of an article, archived old versions in a Git repository, presented the changes in a nice front-end, and integrated edit times directly into article traffic charts. This has also been a useful competitive tool, because we can hook into competitors' sites, store archive of versions of their articles and deconstruct optimisation strategies. The ideas area is a Reddit-style tool that allows staff to submit ideas for projects and new business ideas, which other users can then upvote.